Kids tend to love to take nature walks or explore the backyard or playground and collect things that they find. This time of year is perfect for that because they might find leaves of many different colors (and don’t miss the opportunity to talk about why leaves change colors) as well as berries, seed pods, dried grass, acorns and more. Of course it is great to just collect these things to observe or to use in art projects, but another fun idea is this sensory cutting tray from Kids Craft Room. 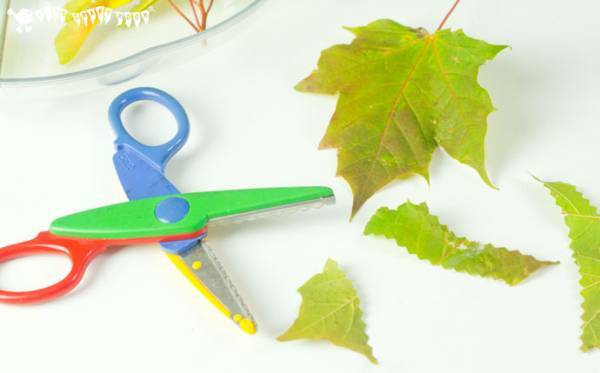 Whether you gather the items yourself or let the kids do it, allow them to cut, crumple, tear and explore. She has lots of great tips about how to make this activity more educational, so be sure to click over for all the details.